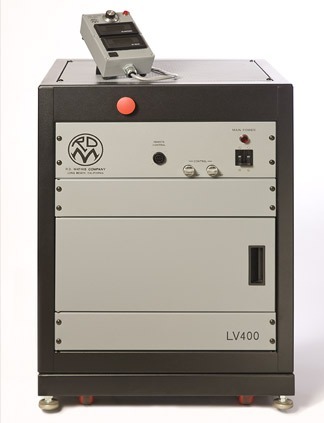 The “LV Series” power supplies are low voltage, high current AC and uniquely designed for thermal evaporation. The power supply’s primary use in the thin film industry is supplying power to resistive evaporation sources. The low voltage, high current AC power supplies were designed to meet a growing need for versatility and reliability in the industry. Both units incorporate a hand held remote control that displays amperage and voltage outputs while allowing an operator more freedom to move closer to the viewing port or the monitoring instrumentation. The low voltage, high current tap switch enables voltage range changes with ease and without having to relocate bulky cables. The units are SCR controlled and can receive up to 4 different type input signals to operate in a semi-automatic mode. The current limiting, soft start and interlock switches make these units extremely user friendly and easy to operate. Available in either 4KW (800 amps @ 5volts) or 7.5KW (1,500 amps @ 5 volts), the conservative power ratings allow the units to run cool, while rugged construction and quality components make them reliable. We also offer 250amp and 500amp welding cables, cut to size, with a variety of terminal lugs (installed) to complete your power set-up.